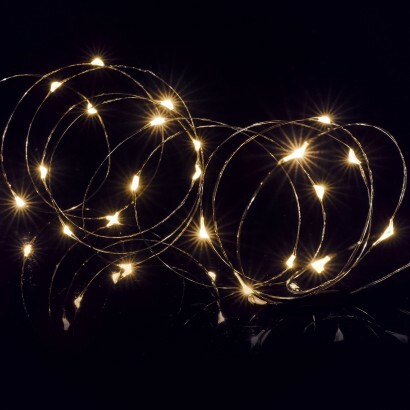 With super flexible wires, Micro Bright timer lights can be manipulated into shapes or bent around flowers and throughout bouquets to give table decorations and room features a little extra wow! One hundred warm white LEDs add warmth and a touch of magic to your home with eight functions including flashing and static and there's a timer function too for pretty fairy lighting without any fuss. With 5m of illumination, these timer lights are perfect for creating table decorations, creating displays indoors and outdoors and even for costume design, simply customise and enjoy!